***UPDATE 5/13/13: Dr. Kermit Gosnell was found guilty today of 1st degree murder in 3 of the four deaths of infants at his clinic and is guilty of manslaughter in the death of patient Karnamaya Mongar. The jury spent 10 days deliberating the 258 total charges that he had against him, inlcuding charges of infanticide and racketeering. ***UPDATE 2: 5/15/13: To avoid a possible death sentence, Gosnell agreed to waive his right to an appeal and will serve the rest of his life in prison. In January of 2011, I posted an article titled “Blood Money” where I wrote about Dr. Kermit Gosnell. He’s been on trial in Philadelphia for the past six weeks, accused of over-medicating a woman who came into his clinic for an abortion that resulted in her death, and for performing illegal abortions on 4 babies who were born alive and were past Pennsylvania’s 24-week limit. He was originally charged with killing 7 children, but three of those charges were later dropped. 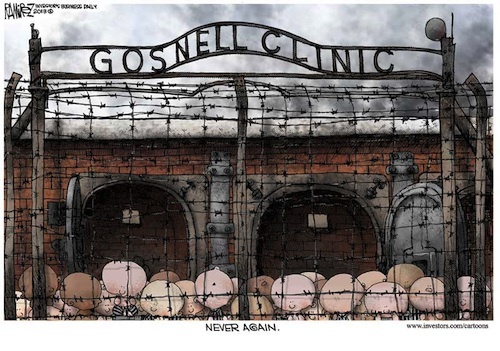 Witness after witness testified that Gosnell and others snipped the spinal cords of the children after they were born alive and had been breathing on their own, one as long as twenty minutes. Investigators described his clinic as a “house of horrors”, where patient files were stained with blood; the bodies and body parts of aborted babies were kept in containers (including jars, plastic milk jugs and bags) in freezers and on shelves; and flea-ridden cats roamed freely in areas where patients would be treated. There were no nurses at Gosnell’s clinic, Women’s Medical Society, and no actual doctors other than Gosnell. Without supervision, untrained and unlicensed staff members (including a 15-year-old high school student!) routinely performed medical procedures and administered drugs to patients, most of whom were low income black women and immigrants. It’s interesting to note that Gosnell had a different set of rules for the few suburban white women who walked through the doors of his death house. The grand jury reported in those cases, Gosnell insisted that he be consulted at every step. When an employee asked him why, he said it was “the way of the world.” By the way, Gosnell himself is an African American. A former employee told the grand jury that Karnamaya Mongar, the immigrant from Nepal who died at the clinic, would have received the same treatment as the “rest of the Africans and Asians.” In other words, no doctor overseeing the medication she was given, the same filthy waiting areas and linens, and she wouldn’t have been led upstairs where the only clean room was as the white patients were. Also, the clinic had no working monitoring or resuscitation equipment, which could have made the difference between life and death for Mrs. Mongar. All of this went on, even though multiple state and local agencies were aware of the substandard conditions. The local Planned Parenthood also knew, and in fact had been told by some of Gosnell’s former patients. What they decided to do was leave it to the women to report the incidents themselves. As a result, Gosnell’s business went on as usual for decades. As a jury decides his fate, it’s frightening to realize that none of this may have ever become known had it not been for the raid federal agents conducted on his clinic in February 2010. The raid came about because of Gosnell’s other income stream his clinic provided to him: selling drugs. Gosnell was one of the top OxyContin prescribers in the state of Pennsylvania, his “day job” which went on in his absence when he would leave blank prescription pads (with his signature) for his non-medical staff to dispense to “patients” and their friends. He came in the evenings, often late at night, to perform abortions. He was a drug dealer by day and a baby killer by night. As long as the women could pay, they could have whatever they wanted– drugs, late-term abortions, under-age abortions—money is what mattered to him. Not the law, not the health of the women, and certainly not the babies. I’d never heard this part of the story until I started reading the grand jury report for myself. It’s probably because what went on at night was so ghastly and heartbreaking that the details of his other grand money-making scheme seemed insignificant. The current trial is dealing only with his murder, infanticide and charges related to that part of his business. CLICK HERE to read the Grand Jury report. WARNING: very disturbing and graphic; I had to stop reading it.